You are here: Home / Crafts & DIY / Arts & Crafts / How to make a jar terrarium. 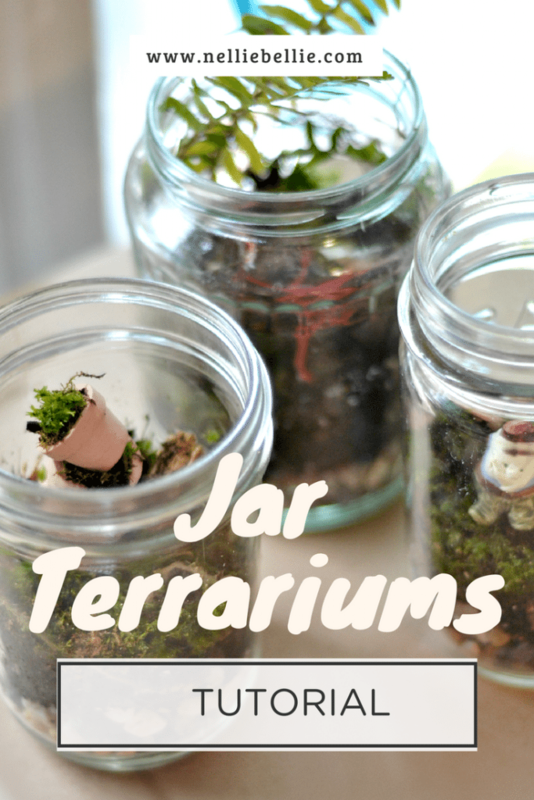 How to make a jar terrarium. Terrariums have invaded Pinterest, magazines, and all sorts of sites. They are everywhere! And, for good reason. They are little jars of happiness that take care of themselves, are easy to make, and don’t have to cost a lot. How could you NOT love them?? That would just be silly. 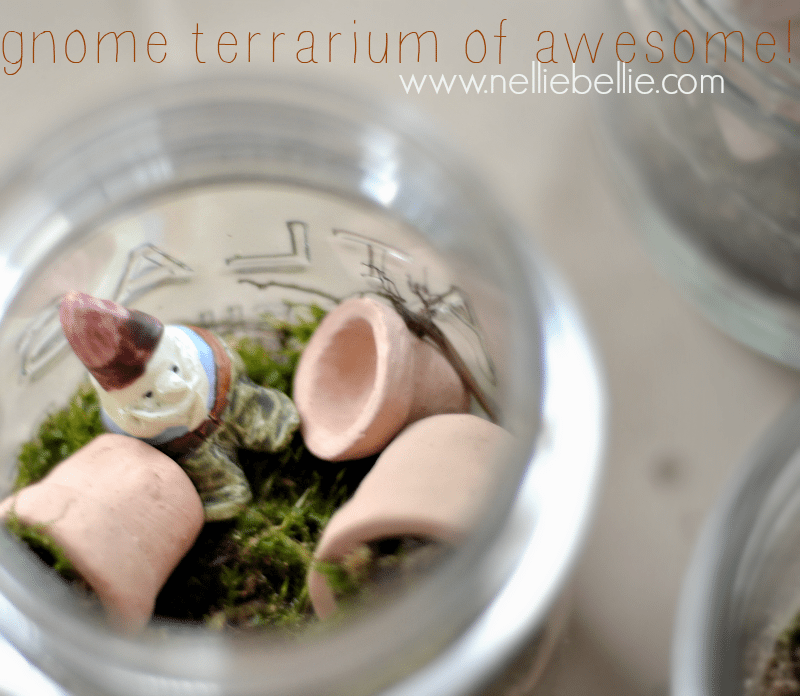 So, if you are ready to jump on the terrarium bandwagon and don’t know how to make a one… we have the easy terrarium diy, today. 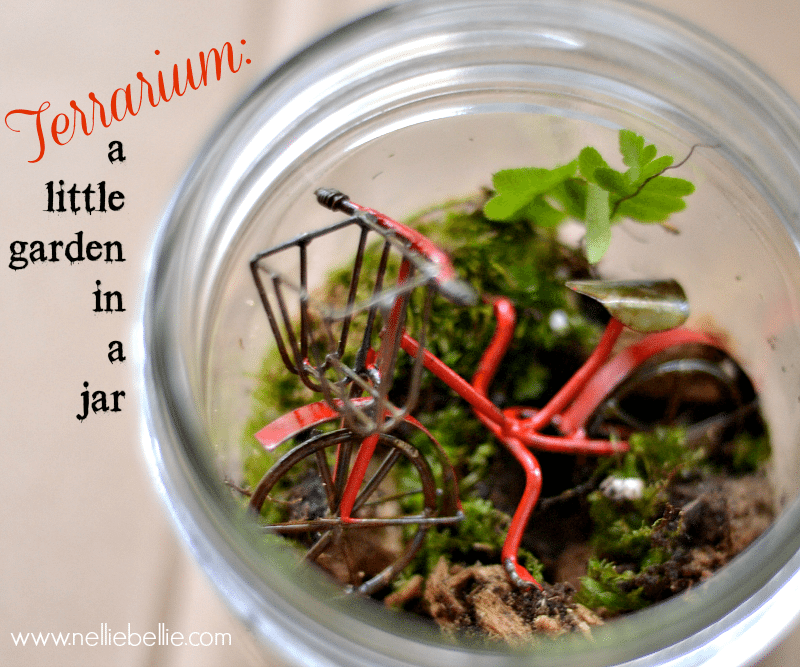 This one is for a terrarium in a jar, an easy and inexpensive way to pretty up a corner of the bookcase! These terrariums are made in jars from my recycling (I made mini terrarium necklaces once…so cute!). They aren’t expensive and anyone can make them. And the best part is that you don’t need a green thumb to care for them. If you follow the instructions for making one it is virtually a self-care garden. 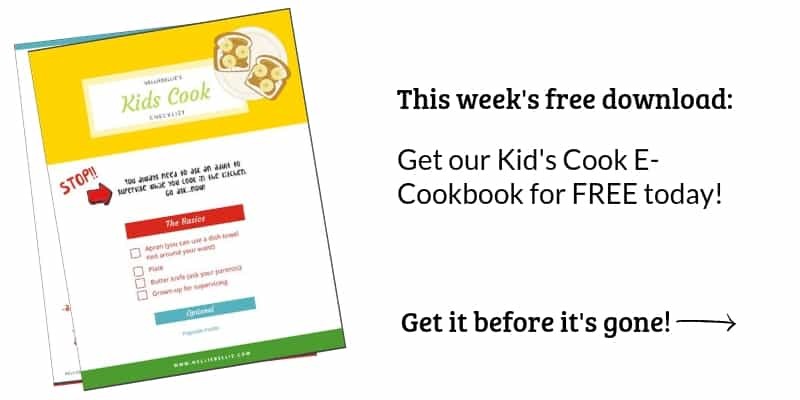 They are perfect for children, your kitchen counter, and adding a bit of life to your coffee table. Don’t miss out on adding some whimsy to your terrariums! Head to your local garden center and look through the fairy garden supplies for accessories to add to your terrarium. For ours, I used a mini bike, a gnome, and mini pots. They are so crazy cute! Start with a medium, clear glass jar. Your recycling bin most likely has a good option. Fill the bottom of the jar with a small layer of activated charcoal. This isn’t a necessity for your terrarium to live but it is super fantastic for keeping the jar constantly humid and long-lasting. Your local garden center will probably have it or even most home improvement centers. Add a 1-inch layer of gravel or small rocks for drainage. Add a thick layer of potting soil. It is a good idea to get potting soil made for indoor plants if you can. Plant small ferns, succulents, or even cacti in your soil. You want to keep about 1 plant per 1-inch diameter, if possible. A good resource for small plants for your terrarium is your local garden store’s fairy garden section. Generally, plant your largest plant first so you leave enough space. Once you have your plants planted add a small layer of decorative rocks, moss, or sand. Finish with your small extras, if you decide to use them. Try to keep a bit of humidity in the jar. If there is a bit of moisture on the side of the jar, it’s fine. If not, give the jar a gentle spray of water or drip a bit of water along the side of the jar. It is generally not best to simply pour water in the jar. And, overwatering can happen very quickly! A little bit is all you need. I love your tutorial. I organize one day getaways for women. We are heading out to the forest in the fall and will collect moss, etc. to make a terrarium. I’m wondering if it’s important to clean the moss, etc. first to avoid mold and bugs. Did you have any problems with yours in this respect? Any input you have would be appreciated.